Jay Wright, one of the most successful coaches in Philadelphia Big 5 history, is in his 15th season at Villanova. IT WAS 15 YEARS ago and one of those basketball weekends you never forget. And not for just what happened on the court. Like last weekend, the East Regional was in town, a regional that would send Shane Battier, Jay Williams and Duke on to win the 2001 national championship in Minneapolis. The rumblings about Steve Lappas' job at Villanova began during the Thursday evening Sweet 16 games. They become a full-blown fire the next day, the off day between games. By late afternoon, Lappas was out, officially a resignation. That Saturday, Lappas flew to Massachusetts, where he would be introduced as the UMass coach on Monday. 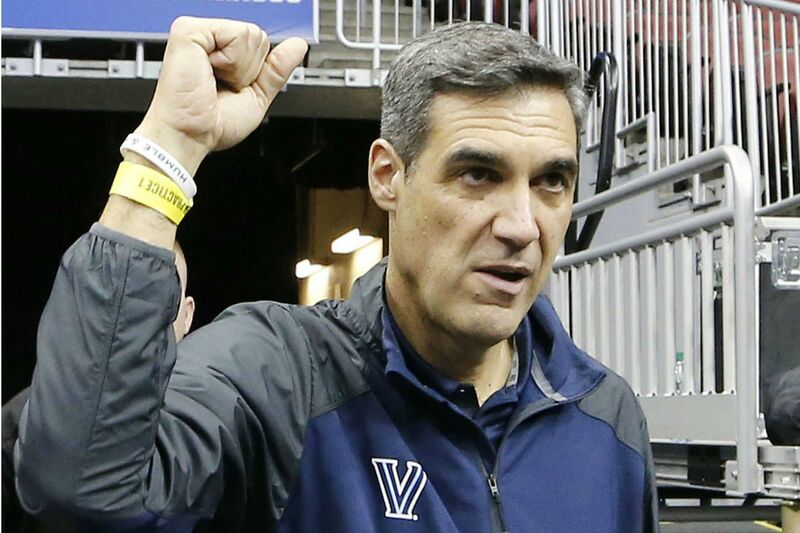 Then Hofstra coach Jay Wright, who was somewhere between hours and days from accepting the Rutgers job, was interviewed for the Villanova job on Saturday and hired on Monday. His news conference at Villanova was that Tuesday. Lappas had a nice run at Villanova. His last two teams were 20-13 and 18-13, each barely missing the NCAA. His final team was hit by a serious illness and a significant injury. The previous season, the Wildcats lost an NCAA-killing home game to Miami when the Hurricanes hit a game-winning shot after the buzzer that was ruled good, a call so obviously wrong that it led to what we now know as replay review. It was also true that Lappas' last few 'Nova teams were not up to the early standards he had set with the Kerry Kittles teams, and his tenure might not have lasted much longer under any circumstance. Lappas, now a successful basketball commentator for CBS Sports, will be in Houston this weekend working, watching Wright's Villanova team play in the Final Four. "I think Jay is one of the top coaches in the country and I think they're going to win it,'' Lappas said. Wright was a scorching hot coach in March 2001. His final two Hofstra teams had gone 50-12. He was rumored for every significant opening. He had grown up in Bucks County a Big 5 fan, played at Council Rock, coached under Rollie Massimino and alongside Lappas at Villanova. "Oh, yeah, because as you might remember, he was getting a lot of attention from other schools, and he was very far down the path with Rutgers,'' Nicastro said the other day when asked about that weekend. "We had to move pretty quickly to get his attention. Had we waited a day or two, he may have been farther down the path with Rutgers and wouldn't be able to come back to look at the Villanova job." However it all played out that weekend, the last 15 years have been wildly successful at Villanova, especially considering this era when the major football schools with the deep pockets are also dominating basketball. The Randy Foye/Allan Ray/Kyle Lowry teams made Villanova a national player again. Scottie Reynolds, Dante Cunningham and Dwayne Anderson got them to the 2009 Final Four. The last three seasons, the Wildcats have gone a mind-boggling 95-13 and are one of only four teams alive for the 2016 national championship. Wright's teams have totally dominated the new Big East and, after only 15 seasons, he is only two wins from becoming the first coach to win 50 Big 5 games. Only three coaches had comparable City Series runs and all of them are in the Naismith Memorial Basketball Hall of Fame. Chuck Daly went 19-5 in six seasons at Penn. Jack Ramsay went 34-10 in 11 seasons at Saint Joseph's. John Chaney was 35-11 after 14 seasons at Temple before going only 14-14 in his final eight seasons to finish 49-25. Those 49 wins are the record, but not for long. After three consecutive 4-0 Big 5 seasons and six overall, Wright's Villanova teams are 48-12 in the City Series, a cool .800 winning percentage, best in Big 5 history. Wright has won 352 games at Villanova and 474 overall, with 18 NCAA wins and is one of only three coaches in city history with two Final Fours. It is an incredible résumé for any school much less at a small Catholic school, the kinds of schools that have been largely left behind in this era of power conferences. The last Catholic school to make the Final Four was, that's right, Villanova seven years ago. That is the kind of program Wright has built on the Main Line. Wright's program is one of the best in city history and absolutely one of the best in the country right now. Really, all that he has left to accomplish is to give the city its third national championship and first since Massimino's 1985 Villanova team. This Wildcats team is certainly talented enough and confident enough to beat Oklahoma Saturday and either North Carolina or Syracuse Monday. This is a veteran group that starts two seniors and two juniors with some young energy sprinkled in to form a seamless eight-man rotation, a team that has been coached for this moment. Finishing his 15th season at Villanova and 22nd overall as a head coach, Jay Wright is in his coaching sweet spot with a team perfectly attuned to how he wants it to play and sharp enough to make subtle changes on the fly that turn games their way. This could be their time.